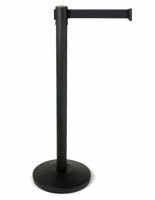 Media Size: 7" x 11"
Designed to coordinate seamlessly with our RCCSTBLK01 QueuePole.Economy retractable belt crowd control stanchion! 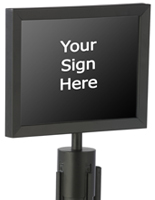 Easy-attachment method allows you to change your sign quickly and easily! Double-sided sign can display two distinct messages! Non-glare lens offers readability at any angle! 7"w x 11"h signs can be printed from virtually any printer! No need to have expensive signs made! 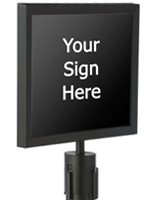 This stanchion sign is a perfect addition to your QueuePole.Economy stanchion posts. 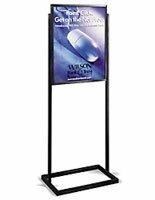 A stanchion sign, also known as a stanchion frame, displays your important message or messages in virtually any location. 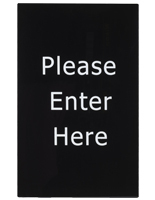 This black powder-coated steel stanchion sign can hold 'WELCOME' or 'THANK YOU FOR YOUR BUSINESS' signs at your local bank. Affix a stanchion sign to a stanchion at a museum to warn patrons 'DO NOT TOUCH THE DISPLAYS'. A stanchion sign are great for many more locations, like ticketing lines, restaurants, retail stores, concession stands, nightclubs and much more! 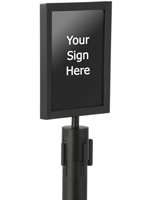 This crowd control sign frame, stanchion sign is crafted to coordinate seamlessly with our RCCSTBLK01 QueuePole.Economy retractable belt crowd control stanchion. 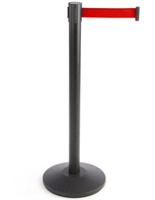 The stanchion sign is also crafted black powder-coated steel with a matte finish. This sign frame is double-sided to attract attention from various angles. The stanchion sign features a sturdy expanded PVC backer, which can even be brought to your favorite local sign shop to have permanent vinyl lettering applied. Each side of this sign frame also features a clear plastic non-glare lens to both protect your signage and ensure it is readable by your patrons or customers. 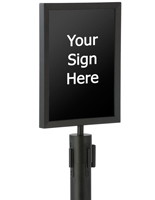 To assemble your stanchion sign, simply slide your sign package into the 5/16" wide channel atop the frame and slide the frame right onto the pole. 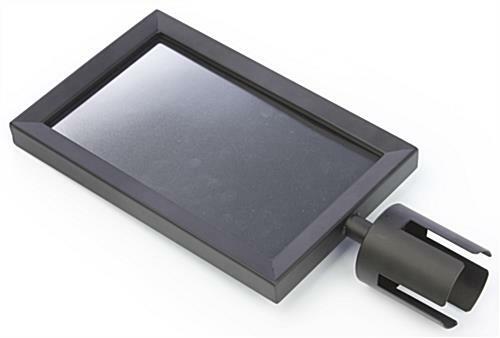 Please Note: This sign bracket fits only QueuePole.Economy Series retractable posts (sold separately) and will not fit posts from other manufacturers or with other brand names. 7.3" x 16.0" x 2.5"